French Friday: Les Allemands ne sont pas assez rapides! Last Teutonic Tuesday I presented you a 1960’s Porsche 718 RS60 to show you my panning-trial. Of course the French had to respond. The French and Germans have always been very competitive, both on sports, technology and even on territory. Resulting in many ‘clashes’. And boy did this little French car try: you even see my finger on the picture above. And no: This is no fantasy car of some kind. This, my dear fellow LaLD’ers, is a Venturi Fétish. And they actually produced these, in very small numbers. Actually it’s Monegasque nowadays and not French but I doubt many of you will make a problem of that. The Venturi Company started out being French and relocating it to a French-speaking microstate doesn’t make it completely non-French anyway. So let’s give it another try. Sorry, but this is the best I can do right now. Not looking that bad actually. And it’s growing on me. RockyClock gave me, as always, fantastic advice on the matter, thank you for that! But what is this nimble little French car? It’s a French sports car like a Tesla Roadster: an electric powered 2 seater. Introduced 4 years before Elon Musk came up with the Roadster: 2004. Production started somewhat later (2007) but even that was still before Tesla introduced the Roadster in 2008. And like Tesla, Venturi used another car as a start to develop this one: the Renault Sport Spider. But instead of the Renault Petrol engine used for the 2002 concept, Venturi mounted an American AC Propulsion electric motor with 245 hp and 220Nms of Torque. And that torque probably isn’t that impressive, except for the fact it’s instantly available. Using 7200 lithium-ion battery-cells (350kgs!) it wasn’t that heavy, just under 1100 kgs. Resulting in an accelleration from 0-60 in just over 4 seconds. And a (restricted?) top-speed of... 170 km/h. One aspect Elon Musk did think better about was the Tesla’s price-tag though: at 450k euros this Venturi was doomed to be rare. Gildo Pallanca Pastor, Venturi’s 6th owner in about 30 years of existence, was aware of this and only planned to produce 25 of these. Later Fétishes are said to have gotten an uprated electric motor putting out 300 hp and 380Nm of torque, resulting in an increased top-speed of 200 km/h and getting that 0-60 done in less then 4 seconds. Wait a minute, what’s that: Exhaust-pipes??? 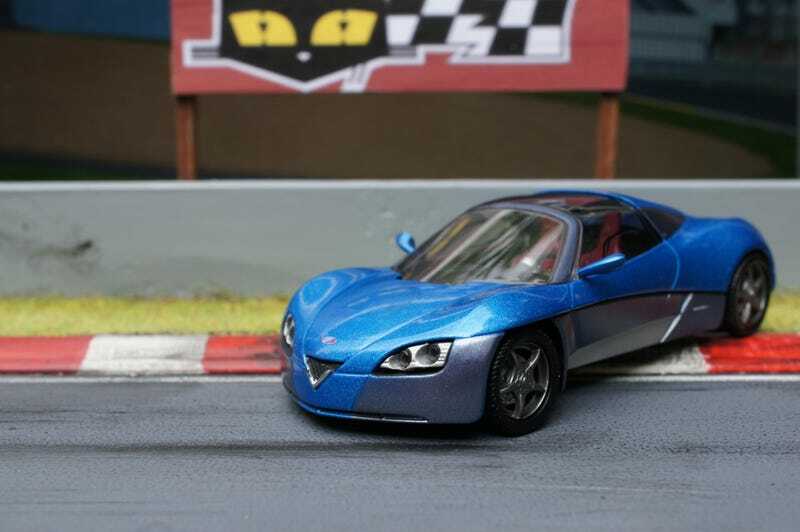 I know the producer of this 1/43, Norev, isn’t as accurate as a Minichamps for example but putting an exhaust on an electric car seems a little bit too weird. But no. Even that could be correct. After the 25 produced electric Fétishes, in 2011, Venturi introduced an old-school version as well by putting a petrol engine back in it according to Wikipedia. And Wiki states it to have 299 hp but I can’t find much about it and find that to be somewhat overrated. If true, I suspect it to be Renault’s 2-litre RS engine and the power should be a bit over 200 hp, still not that bad for a car just over 1000kgs. And maybe the model is just of the 2002 Fétish Concept, which was Petrol engined anyway. Because the probably more accurate French Wiki doesn’t mention this re-mounting of a Petrol engine. And no: this is no 50+ euro diecast you see here, I think I paid like just over 10 euros for it. Other aspects of the car show this a little bit. The missing wiper. The Venturi ‘V’ at it’s nose. But after using all those 50’s and 60’s models the last few weeks I just had to throw in some more modern diecast. And I actually love it, mostly due to it’s obscurity. But Venturi’s best? Never. That will always be the ‘MVS Venturi’ to me, their first car. But I’m still on the hunt for a 1/43 of that one. But that one is hard to get, most of these are Venturi ‘Atlantique’ versions, the 2nd gen so to speak. C’est ca. I probably should have told you some things about it’s designer, Sacha Lakic, but this name won’t ring a bell to much of you. He is of Voxan-fame (a French obscure Motorbike company) and Voxan was bought recently by... Venturi.